The Wine and Cheese Place: 2016 Picpoul is here! One of our favorites is back in stock! More of the new 2016 vintage has arrived. 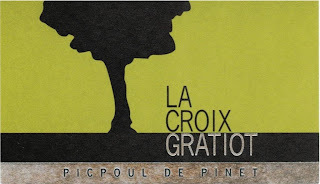 For a grape variety that can sometimes be aggressive, this is an beautifully balanced Picpoul. The nose is perfumed with floral, and tropical fruit notes. In the mouth the wine is full of stone fruit, melon, and fruit cocktail notes. The soft fruit is tempered with an intense minerality, and citrus notes. Picpoul de Pinet has always been a textbook match for oysters, mussels, and just about any other type of shellfish you can imagine. About Picpoul de Pinet: Known as the “Chablis of the South”, the wines of Picpoul de Pinet are crisp, bright and refreshing. The name Picpoul, literally translates as “Lip Stinger”, referring to the grape’s naturally bright acidity. A line of hills protects the appellation of Picpoul de Pinet from the northwestern winds, while the coastal winds from the Mediterranean temper the summer heat. The appellation includes six communes: Mèze, Montagnac, Pinet, Florensac, Pomérols, and Castelnau-de Guers.